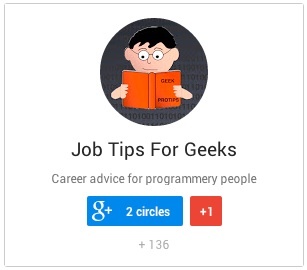 JobTipsForGeeks.com is the blog of Dave Fecak. Dave has been involved in the hire and recruitment of software engineers and technology professionals since 1998. He is the founder and former president (2000-2015) of the Philadelphia Area Java Users’ Group. Dave has written articles about job search strategy, interviews, résumés, salary negotiation, and other career topics for several years and published his first ebook Job Tips For GEEKS: The Job Search in June 2013. Dave has been republished, referenced, or quoted by several online publications, including The Washington Post, Lifehacker, Fast Company, IT World, and CBS News Moneywatch. Dave is also a paid contributor to technology websites DZone, regularly comments on career topics at Hacker News, and is a moderator of Reddit’s CS Career Questions. Dave is the founder of a boutique recruiting and consulting company, Fecak Inc., that helps companies in Philadelphia and New York City with recruiting and implementing strategic hiring initiatives. He is also a founder of a résumé review and writing service, Résumé Raiders. You can find his most recent writings here at Jobtipsforgeeks.com, and be sure to follow @jobtipsforgeeks on Twitter.